2. On right hand side in login section, you can see Forgot Password link. Just click on this. After this just have a look on first two and last digit of mobile number and click on "Yes" button in-front of Do you wish to send OTP on the above mobile number ? 4. Now they will send OTP to your registered Mobile Number, Enter the received OTP and Click on Verify button. 5. Once your OTP verified, You will get next screen to enter your new password. Just enter and re-enter the new password and click on Submit button to finish the password reset process. Once you reset the password successfully, You can login to this website to verify your details. 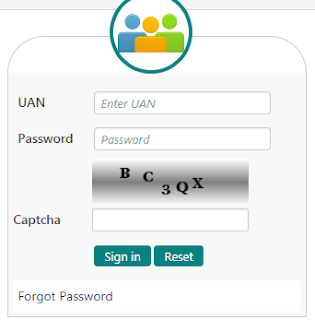 To view e-Passbook or check your PF balance you can use below steps, Make sure to login only after a day of changing your password as latest password reflected to below website after one day. I am unable to change my UAN password. Is there conditions are there to reset password..
What error you are getting ? Do your mobile number registered with Aadhaar ? I have UAN number and EPFO password. But when i want to see passbook, it is directing me to www.epfindia.gov.in >> Our Services >> For Employees >> Member Passbook. But if i put same EPFO password in EPF india website, it is generating error. i am unable to set up a new password. its asking for a special character fr the password bt its not accepting any of the special characters. when on reset password page, i enter the new password and confirm password, it gives error "Enter Valid Password." What crap website is this? Despite 100 attempts of setting password as per instructions all efforts got failed. The administrators doesn't seem to bother of complaints. Then first you need to register your mobile to EPFO office, Visit to nearest EPFO office and update the same. You can also ask your employer to update your new mobile number,As most of the employers now a days keeps a few employees that visit EPFO office regulary to perform these kind of tasks for their employees.